But there was a problem: the data being displayed on the map wasn’t being updated reliably. I’ve always known there were cacheing delays inherent in the approach I’d described, which involves Google Spreadsheets, Yahoo Pipe, Google Maps, as well as local browsers all calling on each other an all potentially cacheing the data, but never really worried about them. But for this example, where the data was changing on a minute by minute basis, the delays were making the map display feel too out of date to be useful. What’s needed is a more real time solution. I haven’t had chance to work on a realtime chain yet, but I have started dabbling around the edges. The first thing was to get the data from the Dallas Police website. A tweet resulted in a solution from @alexbilbie that uses a call to YQL (which may introduce a cacheing delay?) to scrape the table and generate a JSON feed for it, and a PHP handler script to display the data (code). – use the interactive Google web maps API to create a map and add markers to it. In order to place the markers, we need to call the Google geocoding API once for each address. Unfortunately, in a quick test, I couldn’t get the version 3 geolocation API to work, so I left this for another day (and maybe a reversion to the version 2 geolocation API, which requires a user key and which I think I’ve used successfully before… err, maybe?!;-). So – the static maps route it is.. how does it work then? I tried a couple of routes: firstly, generating the page via a PHP script. Secondly, on the client side using a version of the JSON feed from Alex’s scraper code. I’ll post the code at the end, but for now will concentrate on how the static image file is generated. As with the Google Charts API, it’s all in the URL. It would be nice if the service was a live one, with the map refreshing every couple of minutes or so, for example by pulling a refreshed JSON feed into the page, and updating the map with new markers, and letting old markers fade over time. 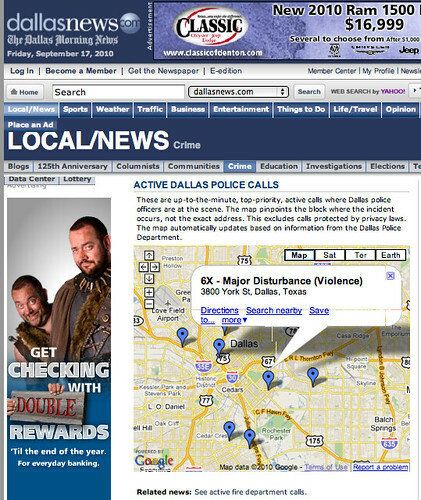 This would place a load on the original screenscraping script, so it’d be worth revisiting that and maybe implementing some sort of cache so that it plays nicely with the Dallas Police website (e.g. An Introduction to Compassionate Screen Scraping could well be my starter for 10). If the service was running as a production one, API rate limiting might be an issue too, particularly if the map was capable of being updated (I’m not sure what rate limiting applies to the static maps api, the Google maps API, or the Google geolocation API? In the short term (less coding) it might make sense to try to offload this to the client (i.e. let the browser call Google to geocode the markers), but a more efficient solution might be for a script on the server to geocode each location and then pass the lat/long data as part of the JSON feed. Jennifer also mentioned getting a map together for live fire department data, which could also provide another overlay (and might be useful for identifiying major fire incidents?) In that case, it might be necessary to dither markers, so e.g. police and fire department markers didn’t sit on top of and mask each other. (Not sure how to do this in static maps, where we geocoding by address? Would maybe have to handle things logically, and use a different marker type for events attended by just police units, just fire units, or both types? If we’re going for real time, it might also be interesting to overlay recent geotagged tweets from twitter? Anything else I’m missing? What would YOU do next? Move the data from the spreadsheet into Google Fusion Tables maybe with the Google Data API, where it can be geocoded and exported as kml. Then revert back to using Gmaps v3, loads of win in doing that, far less JS no key required! The Fusion Tables can then return you query-able kml**. **I haven’t actually done that, nor moved data from a spreadsheet to a Fusion Table, so cannot share code with you on that, but that’s what I’d look at trying next. Failing the Fusion Tables move, I’d seriously look at generating kml from PHP, you can set infowindow template and marker declarations in the first part of the kml file. Alas I’ve reached the edge of my ready knowledge. Minute by minute update of a kml file can be got round (append a datestamp to the query string ?123456789 etc). But my cursory grasp of the Fusion Table (DATA) API docs suggested that new data could be pushed in. And presumably deleted… so that in effect you are maintaining a virtual database, but for what? Umm, so it creates kml and can be shared and can be diced up I suppose. Its all sounding non-trivial to me though (you too by the sound of your 5mins turns into 3hrs twt), sorry I’m no more help today – other things calling. Speaking as an end user and product manager, not as a programmer… The problem with all of these interactive mapping ideas is that they suffer from data rot. There’s no good way to show the data collection over time without saturating the map with too many data points. My suggestion is to use fading colors to indicate older data. E.g. dark blue for events that happened in the past 24 hours. Events that are 24-48 hours old would be medium blue. Events that are 48-96 hours old would be light blue. Events that are 96 hours to 30 days old would be very pale blue spots (no outlines) and these would overlay each other so that if you have a “hot spot” where the same type of event happens several times a month it becomes a darker blue spot on the map. THIS gives me the info I want – not just “what’s happening today” but “what happens in this location over time” in a visually obvious way, so I can make a more educated assumption about the current events – are they just “business as usual” for that location, or is this something unusual, exceptional? @JC Agreed… my feeling was that as a “current news” map, the most recent information would be the thing to depict; but I can see that a timelapsed layer might also be interesting, and give a more accurate picture of an area than an annual summary crime statistic. I also thought that fusing the data with other information may be interesting from a news gathering point of view. 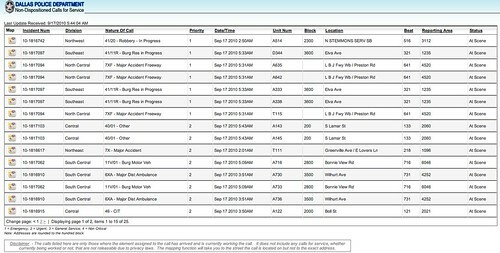 For example, adding traffic, twitter and fire service overlays might make allow you to see major incidents clearly from a purely data driven point of view? I wanted to thank everyone for putting so much thought into my maps! At your suggestion, I’ve been working with Google Fusion Tables. 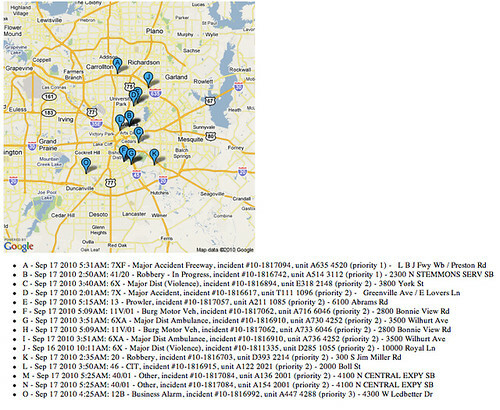 I like the speed of the geolocation tool, but miss the ability Pipes gives me to clean up the data. For example, I can use Pipes to change police jargon into more understandable English. It seems that each of the tools has its benefits, and the trick is to find the right one for each job. How can I get this on a WordPress page? How can this become a widget or code for a wordpress page so that it can be embedded. Previous Previous post: So WTF is Data Scholarship?